I've been out scouting field trip sites for my intro class, and I want to test some observations. Non-geologists, I need your help! I've got four pictures here. 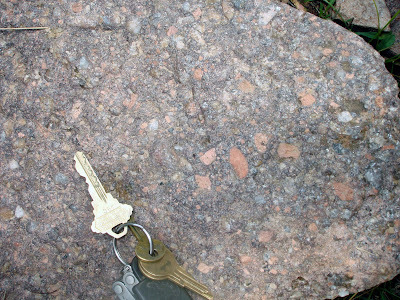 The last two are of the same rock - the second is just a close-up picture taken a few inches from the first. I'm curious what you see when you look at these pictures (aside from my office keys, which were the handiest thing available to use for scale). How are the rocks similar? How are they different? Any speculation on why they're different? Ok. So, I am a geophysicist with no geology training (I am coming from physics) but with a sufficient number of years in Earth Sciences to be a little bit biased. But not so much. Here is what I see. My first reaction was that the rocks look the same. They all seem to have "some pink" in them. But then I saw that the grain size appears different, larger in rock #1 than rock #2. Rock #3 seems to have a larger number of different "stuff" in it and the grain size is more variable. While they all have "some pink", #1 is distinct because it has a clearly black element. I took intro to geology at, of all places, FLC back in the 1970s (btw, you have the best blog title *ever*). Besides grain size, it seems as though rock 3/4 is a conglomerate, so maybe that makes it sedimentary (see how long it's been since intro to geology?) Rock #1 looks as though it was metamorphosed because the grains are smooth. I don't have any opinions about rock #2--well, maybe it looks more jagged than rock #1. I will be amazed if this is at all useful. I have taken intro geo..., Why do I want to use the word pyroclastic? I have no ides what that means really, guess I'll go google it now. same materials, just cooled differently? k has white, black and pink parts, with the white outnumbering the others. The pink piesces are more irregular and smaller than the pink pieces in the last two pictures. 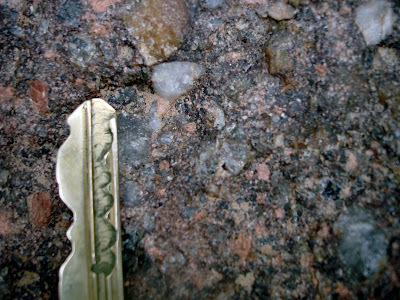 The last 2 picutres show a more granular rock with larger pink parts and fewer white parts. As should be obvious, I'm not a geologist, nor have I had any geological training. Good luck getting your students to see the differences. By any chance, can you find a location where rock 3/4 is in contact with rocks 1 and 2? I AM a geologist, and can clearly see that the angular, interlocking crystals in rocks 1 and 2 are different from the sub-rounded particles in rock 3/4. There's also a difference in crystal/clast size, large in 1, smaller in 2, and a mixture of large and small in 3/4. 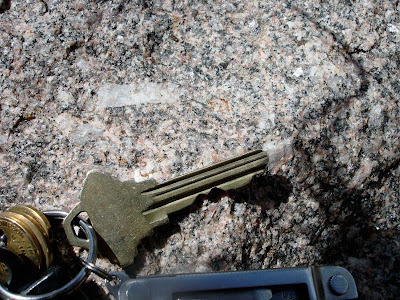 The thing to point out to your students is that the overall composition of the different rocks (granite vs. arkosic conglomerate) isn't as significant as the other features that show different histories of the rocks. Mike - I think the contact is in a little drainage without much exposure, unfortunately. There are other places in the area (with a different rock as the basement) where the relationship is very nicely exposed. (Actually, I posted pictures of one of them last spring.) I want to take them to this spot instead for a number of reasons: 1) they'll be coming back to this spot to study a river, and I want to keep coming back to the same area in hopes that it will seem familiar later on, 2) I think rock 1 is one of the prettiest rocks in the area, and 3) I want a spot where they can identify minerals in different kinds of rock, and the grains in the arkosic conglomerate are big and are different colors, which makes them easier to tell apart for students. I'm thinking of making them make labeled sketches at each stop. (And then sketching what I see on a big white board at the end of the stop, so they get immediate feedback about what geologists notice.) We'll see if that helps them see the differences. And I would say that the texture is more important than the minerals for the big picture of how the rocks formed, but the question of "why are the minerals the same?" is interesting as well. Well, the first two obviously differ in grain size, which I reckon would suggest different cooling regimes if they're igneous, which I'd guess they are. If they're metamorphic the difference might be associated with peak temperature they reached as well as cooling rate. Also, the grain differentiation -- contrast -- is sharper in the first than in the second, which I guess is consistent with either the cooling rate or the peak temperature difference, too. In the third the pink inclusions strike me first, though in the close-up it's the crystal-looking inclusion that's more striking, along with the contrasts -- black, red, crystal, grey, even some amber. I'm not a geologist but have enough knowledge to be dangerous to all rocks! 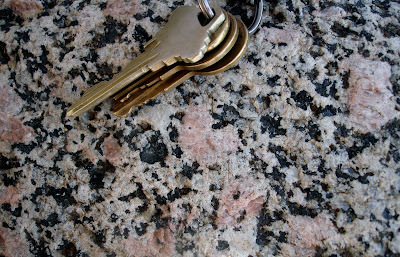 The first two pictures look much like varieties of the Pikes Peak Granite upon which our house sits. But the other stuff looks like some kinda of granitic melt in which previously formed crystals got trapped. They look like something that you'd see on a kitchen bench top or the side of a building ... but I am a geologist so I notice the sides of buildings! Mine's the one with the ruler. What kind of compass do you prefer? Question from a reader: Americans abroad?